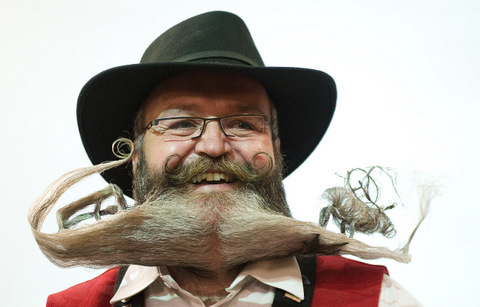 Elmar Weisser of Germany reacts after winning first place of the Full Beards Freestyle category during The Beards and Moustaches World Championship 2011 in the northern city of Trondheim on May 15. A German man scooped the title of world’s best beard on Sunday after impressing competition hosts in Norway with his facial hair featuring a moose and a Norwegian flag. Hairdresser Elmar Weisser, 47, beat 160 hopefuls from 15 countries to take first prize in the World Beard and Moustache Championships, held this year in Trondheim. Mr Weisser is a veteran of the competition, held every two years, having won several times before. He said his sister helped him with the creation, starting work at 7 am. “When my beard isn’t styled, it goes down to my waist. It is sort of folded up,” he said. Mr Weisser took the title in 2005 in Berlin with his beard in the form of the landmark Brandenburg Gate, and two years later won in England for his recreation of the Tower Bridge. He did not compete in the 2009 competition in Alaska. Germany and the United States traditionally dominate the eccentric contest which began in 1990 and has been running regularly since 1995. Moustaches are judged in six categories: natural, English, Dali, Hungarian, imperial and freestyle. Contestants with what is deemed a “partial beard” compete for honours in the natural, Chinese, Imperial, Musketeer, sideburns, and freestyle categories. While those with full beards are divided into the groups natural, natural with styled Moustache, Verdi, Garibaldi and freestyle.